The Achein Center for Lifelong Education will be a place where generations of Native Americans can come together to further their cultural heritage, providing an educational setting by way of classroom learning and community sharing. 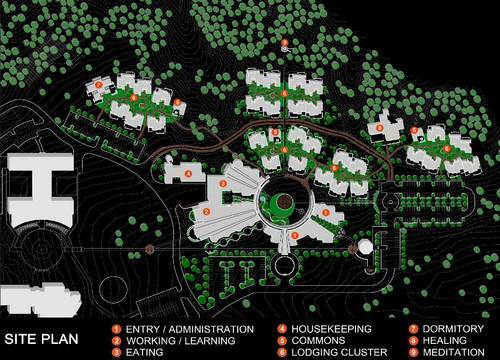 The sustainable campus is composed of thirty buildings organized around a central garden and plaza. Traditional southwest Native American design strategies and materials indigenous to the region are utilized in the design. Planning for the Achein Center came from a grant from W.K. Kellogg Foundation. The concept that arose from our conversations is based upon the unique American Indian perception of mankind and our special relationship to the natural world. It was developed to derive the greatest possible benefit from the potential offered by the natural assets of the site. The overall design incorporates the Native American concept of a “center place.” The plan revolves around a central garden and plaza, which serves as the focus and crossroads for all activity at the Achein Center. The buildings are located to acknowledge and relate to this center place, important axes and distant vistas. Movement to the main office, meeting and dining facilities occurs under a ramada that circles and reinforces the central garden and plaza. The lodging areas are located in a less formal pattern around the center, somewhat akin to the organic growth of many traditional Native American villages. Water, an element that connects all American Indian peoples, is employed in a variety of ways: as part of water catchment and wetlands system of water and wastewater management, as a means to create natural environments that attract wildlife, as a passive cooling device, and as a symbolic feature in the form of a New Mexican stream in the central garden. Buildings are elongated in the east west direction to expose the longer south façade to winter solar gain. Adobe and other high mass materials are incorporated into the structure for passive heat storage and distribution. Ramadas control sunlight and heat gain while enhancing a connection to exterior spaces. All major spaces at the facility are day lit and naturally ventilated through a variety of wall and roof configurations. Materials have been analyzed and selected for their low embodied energy, recycled material content, durability and affect on indoor air quality. The Achein Center addresses issues of cultural and environmental sustainability through a forward looking design with foundations rooted firmly in the past.